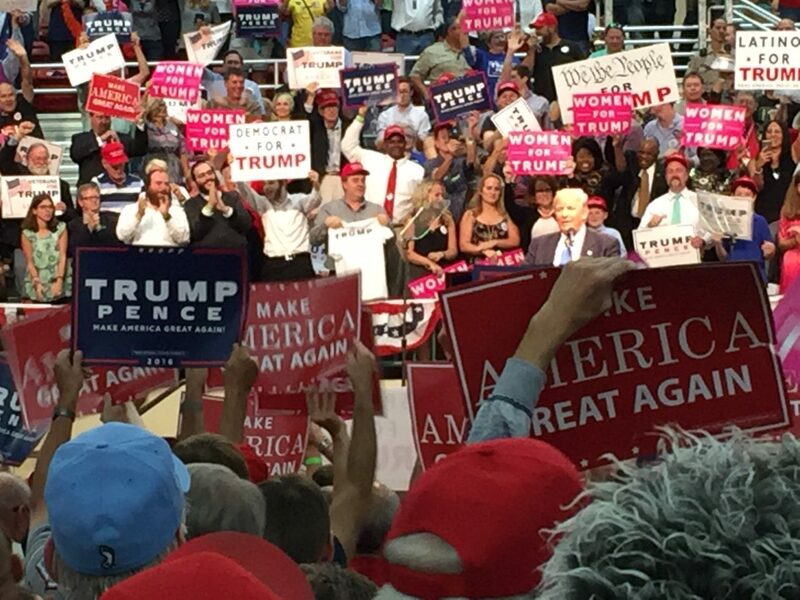 Trump made his remarks at an afternoon rally at the Cabarrus Arena and Events Center. He was scheduled to hold an evening event in Johnston County. His visit comes as polls show a dead heat in the state just five days ahead of Tuesday’s election. It also came the same day Clinton was campaigning in Eastern North Carolina and later in Raleigh with her one-time rival, U.S. Sen. Bernie Sanders. It was the third time Trump and Clinton had campaigned in the state on the same day. On Friday the Real Clear Politics average of statewide polls showed them tied at 46.4 percent. Trump returns to the state Saturday with a rally in Wilmington and comes back again on Monday to Raleigh. The intense focus on North Carolina highlights the close race and the state’s pivotal role. With 15 electoral votes at stake, both campaigns are launching an all-out blitz of candidate and surrogate visits before Tuesday’s election. Trump cited FBI investigations into Clinton’s emails as well as new reports about a probe into the Clinton Foundation. Trump criticized Clinton’s support of the Affordable Care Act as well as her positions on education and Mideast policy. But he also tapped into an issue top of mind for many workers in North Carolina: the loss of manufacturing jobs. The Carolinas were once a hotbed of textile manufacturing until foreign markets joined the game with cheaper labor and materials. Local textile mills throughout North Carolina have since shuttered, often leaving small towns reeling economically. Trump cited Pillowtex, the long-dead Kannapolis textile giant that he said laid off 1,125 people and “took their jobs to Mexico.” The plant’s abrupt 2003 closure actually wiped out 7,650 jobs nationwide, including more than 4,000 in Cabarrus and Rowan counties – the biggest one-day job loss in the history of the state and the textile industry at the time. “Mexico is like a one-way street. They take the money and the jobs, the factories. You know what we get? Drugs and unemployment,” Trump said before moving into a topic typical of his speeches: building a wall at the Mexican border. All that resonated with supporters such as Cliff Miller of Mooresville. He has worked in fabrication for NASCAR and doesn’t know anyone in town who doesn’t support Trump. He said jobs have been lost that the Democrats can’t get back. Tracey Miller, a single mother who works in property management, said she tried to sign up for the Affordable Care Act and realized her annual insurance premium was going up almost $772 next year. That’s with an $11,000 deductible. 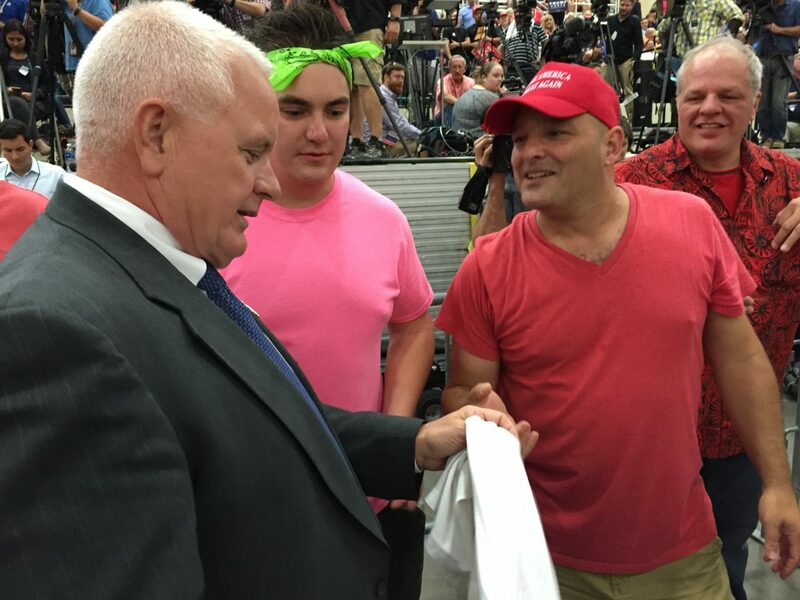 People at the rally varied from first-timers to someone calling himself “Iron Trump” who has been to 17 rallies and lives in Pennsylvania. Sal Marcano, a Laurinburg police officer, was there with his two sons and their friend. “He may have done some things in the past I don’t agree with, but he’s the most honorable man in the race,” said Marcano, a Marine veteran. He said he initially supported Florida Sen. Marco Rubio, but backs Trump over Clinton because he’s pro-life and he thinks she’s hostile to police. “Our country needs to make a fundamental change. We’re just headed in a bad direction,” he said. He also said Laurinburg has suffered from lost manufacturing jobs. Trump started Thursday with a rally in Florida then headed to Pennsylvania before the Concord rally. He planned to go to Selma, N.C., in the eastern part of the state, for an evening rally. He spoke at the Cabarrus Arena in March, during the primary contest, as anti-Trump efforts were accelerating and his support was growing. After Thursday, Trump and Clinton will have visited North Carolina 21 times between them since June. That’s in addition to near-daily rallies over the last two weeks by both vice-presidential nominees and high-profile campaigners such as President Barack Obama (in Chapel Hill on Wednesday and coming to Charlotte on Friday), Ivanka Trump and first lady Michelle Obama. Trump urged people to vote. 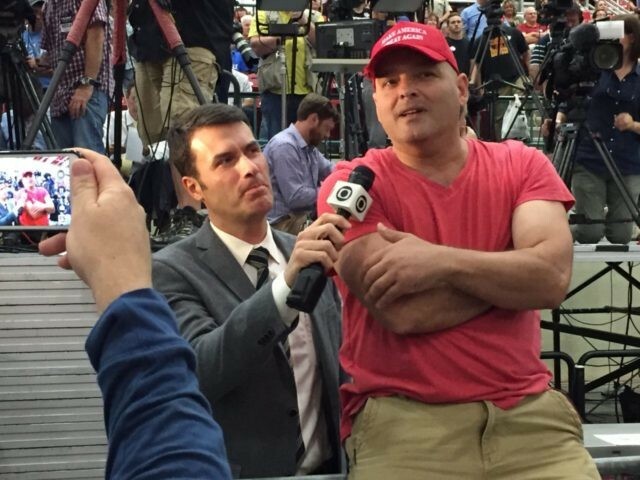 “George,” who told Breitbart News that he is originally from Queens, perched on the police barrier dividing the media tent from the main audience, which police estimated at 3,000 to 4,000 people. At seemingly random moments in the rally, he would shout “Truuuump!” at the top of his lungs, and his voice boomed throughout the hall. The Secret Service paid him a brief visit, as did local police, and told him to calm down. He credited his girlfriend with making the shirt. Rally organizers thought less of the stunt, and asked him to remove the T-shirt, agreeing to return it afterwards. 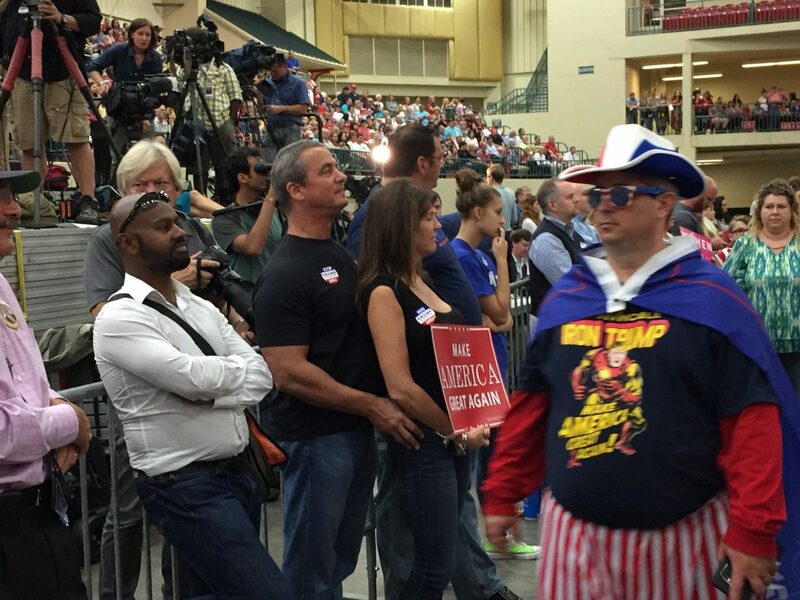 Both Jimbo and Epic Trump Guy attracted the immediate attention of the press, particularly the overseas media. Other attendees came in costume, with several dressed as their own version of Uncle Sam. There were other noteworthy signs at the rally. One, “Democrats for Trump,” was held up by three religious Jews on the bleachers directly behind Trump.